Special Counsel Robert Mueller, and his wife Ann, depart St. John's Episcopal Church, across from the White House, in Washington, March 24, 2019. White House press secretary Sarah Sanders told Fox News Sunday, "I don't think it is going to be damaging to the president." 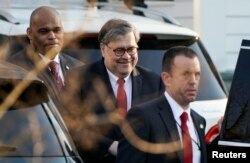 U.S. Attorney General William Barr leaves his house after Special Counsel Robert Mueller found no evidence of collusion between U.S. President Donald Trump’s campaign and Russia in the 2016 election in McClean, Virginia, U.S., March 25, 2019. 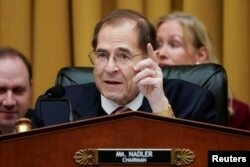 Chairman of the House Judiciary Committee Jerrold Nadler (D-NY) speaks during a mark up hearing on Capitol Hill in Washington, March 26, 2019. On Twitter, Trump said Saturday, "Why should Radical Left Democrats in Congress have a right to retry and examine the $35,000,000 (two years in the making) No Collusion Mueller Report, when the crime committed was by Crooked Hillary, the DNC and Dirty Cops? Attorney General Barr will make the decision!" He was referring to Hillary Clinton, his 2016 opponent, and the Democratic National Committee, which supported her candidacy.